I believe the essence of climbing is exploration, and this is what motivates my climbing. I have an unquenchable curiosity about what is around the next corner, or over the next rise. I’m always on the hunt for first ascents, hopelessly optimistic that I’ll emerge from the scrub oak at the base of the perfect splitter finger crack, or gently overhanging streak of two-finger pockets. I’m also searching for my own potential – a fascinating expedition through sports science – that drives me to forge my body into the best climber I can be. Starting out climbing in the ‘90s my brother, Mark, and I dreamed of one day free climbing Yosemite’s biggest wall – El Cap. But there’s a difference between a dream and goal – a goal is something you think is possible! We toiled through the grades, and by the early 2000’s we naïvely believed we could do it. 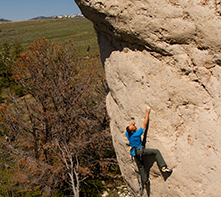 We made a multi-year plan to build to an attempt on Freerider (5.12d, VI). Meanwhile I tore through Utah’s Little Cottonwood Canyon, climbing every 5.12 I could find to hone my granite skills. Finally in Yosemite in 2004, we stoically worked up the climb. When I flashed the crux 23rd pitch, I realized that I hadn’t yet fallen or weighted the rope on the climb, and that I had a chance to flash the whole route – a feat that had never been done (and still hasn’t been matched). At the base of the next crux pitch, the Great Dihedral – nearly 3,000 feet up – I was suddenly very nervous, knowing what was at stake. It was a perfectly smooth corner, with a flared and bottoming crack in the back – my specialty! I recalled all my practice and training, I believed in my footwork and stemmed my way up the corner, thinking only of the climbing and the brilliant position. Before I knew it, I was looking at the belay. I finished off the last few pitches, and the first flash of El Cap! I started climbing as a good excuse to indulge in the splendor of the mountains, so my favorite places to climb are those with stunning scenery and dramatic climbs. For my money, the most spectacular climbing venues are Smith Rock, OR and Zion, UT. Smith takes the cake for dramatic lines and inspiring scenery, while Zion is a labyrinth of mysteries with lifetimes of rock to be discovered. I’m convinced that perfect, 1000-foot-long finger crack is still waiting for me, safely tucked away in a remote canyon of Zion’s backcountry. Mike Anderson has been climbing since the early ‘90s, and has enjoyed all aspects of the sport from bouldering to high altitude mountaineering. 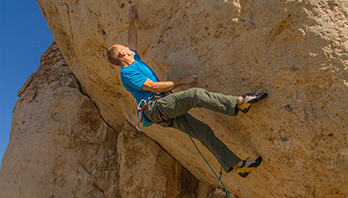 He has climbed extensively throughout the US, and is strongly attracted to the aesthetics of climbing – the quality of movement, and the climb’s setting. In the rock climbing realm, Mike has climbed 5.14s in several states, and regularly onsights 5.13. Mike particularly enjoys free-climbing long multi-pitch routes which he views as the ultimate crucible for testing his skills. Mike has established many long free routes up to grade VI in Zion, Yosemite, and the Wind Rivers. His most notable first free ascents include The Thunderbird Wall (5.13a, VI), Touchstone Wall (5.13b, IV), and Spaceshot (5.13a, IV) in Zion National Park, and Arcturus (5.13b, VI) on Yosemeite’s Half Dome. 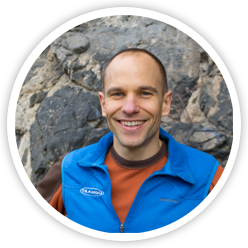 Mike is also a writer and photographer, recently publishing The Rock Climber’s Training Manual. Mike is married to Janelle Anderson, and has two sons Lucas and Axel.